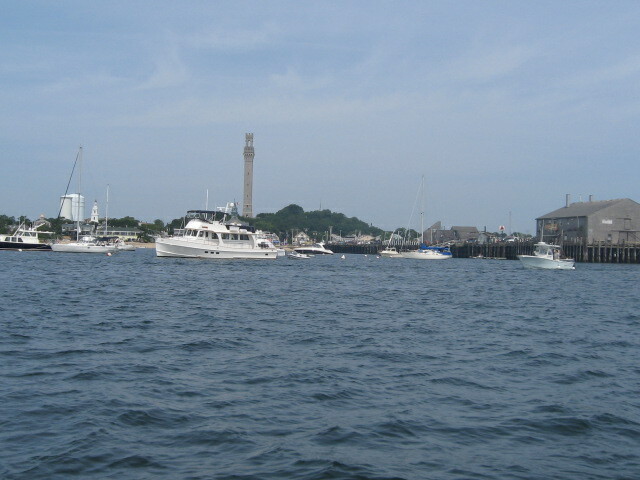 With the excitement of the “bomb scare” over, we continued to anchor in the harbor of Provincetown while waiting for calmer weather. My days were busy, but I did have some downtime throughout the day. I loved to read, so every chance I got, you would find me sitting on the deck or in my room devouring a good story. I really believe without my books, I would have gone insane. Again, I wasn’t use to being away from home for so long, not to mention the no privacy issue. There was always some sort of noise around me, whether it was a radio, a movie on TV, someone talking or the constant hum of the two generators. I longed for a secluded and quiet place that I could retreat to at the end of my workday, but since that wasn’t possible, the next best thing was to get lost in a good story. Another thing I missed was being able to watch two of my favorite daytime shows, Oprah and Dr. Phil (sorry, I’m a female and I fit the demographics). They came on each weekday between 4 and 6:00. At home I would make my dinner while watching the shows. We were able to pick up the local channels while in P’town, and both shows were aired. However, I was on a ship with over 15 guys, and I can tell you, THEY DESPISED BOTH SHOWS, and let me know it every time I tuned in to watch. It was always some comment about Oprah’s weight and being phony or Dr. Phil not being a real doctor and a wife cheater. They had a hoot trying to get me going. I tried to ignore the comments, but it wasn’t always easy. I would usually try to defend the show and would end up missing most of it, so I would give up. I would pass the remote and guess where they would turn it too? The Jerry Springer show! Really? Thank God I had TiVo at home. It was late afternoon and I was particularly bored. I was sitting on the deck reading and half listening to the guys around me. They were talking about guns, fast engines, and the typical guy talk. I wanted to scream at the top of my lungs to shut up but knew that wouldn’t get me anywhere. One of the guys asked me what was wrong as he noticed the look on my face. I told him that I missed being around my girlfriends, that I just wanted to talk about girl things for a while. Like what, they asked? Well, clothes, make up, hair, those were the things I missed talking about. Well, bless their little souls, both captains, Gary and Scott said, “If it will make you happy, you can put make up on us and talk all about Oprah.” At first I thought they were kidding, but they went on to say they knew I worked hard and was missing home, so that was the least they could do. Though it wasn’t exactly the same, I figured this would have to do. I was all over it. I set my make-up tray in the galley and instructed the guys to go shave as closely as possible. Gary was brave and decided to go first. I covered his face with foundation and then proceeded to do his eyes. He had no clue what any of my make-up or tools were. I wish you could have seen his face when I pulled out my eyelash curler. It took about five times of wiping and starting over to put mascara on him. I told him not to blink but it was almost impossible. A little blush, and then last but not least lipstick. It took about half an hour to do his face as he kept blinking and squirming. Next came Scott’s turn. Where Gary was hairy with dark skin and dark eyes, Scott was the opposite, blonde and blue eyes. Scott seemed to love it right from the get go. He knew exactly how to angle his face or place his eyes for me to put the mascara on. We were kidding him that he must have done this before, but he swore he hadn’t. It was a fun diversion for a couple hours and I truly had a blast. Greg had been in his room and we called him down stating we had to talk with him about something. As he came down the stairs and into the galley, the guys were sitting at the table. One glance at them and he was laughing uncontrollably. One by one the other crew members came in and fell into the same bit of laughter, though a couple of them couldn’t believe they allowed me to do that to them. No one had been ashore for leave for quite a while, so Greg gave the guys a challenge. If they would wear their make-up and dress in girls clothes, he would let them (and me) go into Provincetown that night. Of course any chance to get off the ship for a few hours was good news to me. Both captains looked at me and assured me they were only doing it for me. I was elated. I ran up to my room to search for the right outfit for each of them. Thankfully they were both about my size. Thanks Ashley, don’t forget to send me the report we need to fill out.